Black Friday Specials-15% off-Christmas Deals! Buckaroo Horse Tack/Treats for my Horse! Buckaroo gift certificates for that Secret Santa/Stocking Stuffer! Now where to go...............Buckaroo Leather Website!!! 15% off Everything, Including Gift Certificates! Go to Buckaroo Leather, shop the special Pre-Christmas Discounts on select American Made leather Horse Tack and Use the discount code xmas15 at the shopping cart to receive an extra 15% off -including gift certificates. Special Pre-Christmas Deals- Use the code xmas15 and receive an additional 15% off!! Hand crafted from the finest Hermann Oak single ply heavy harness leather, Oiled Golden Bridle Leather w/ chap lining, or NEW ROUGH OUT G. Bridle Med. oiled this Old Martingale style shaped breast collar features an over the shoulder fit for a better pulling position. Also featured is the adjustable neck strap and billet. The breast collar is hand edged, rubbed and finished with nickel hardware. For pleasure or show, the hand craftsmanship and attention to detail will make you proud to use this breast collar on with your favorite horse. Center Option of Traditional Heart Concha! These TOP OF THE LINE Quality Pro Harness Leather Split Reins are for everyday use by the Professional Horseman! These are heavy hand picked uniform harness Split Reins with Hand Beveled edges and rubbed with extra oil for a soft supple feel-Providing the Best ready to use Feel! Made with Hermann Oak Heavy Harness leather. They have the uniform balance through out the complete length. When cut side by side they are PAIRED together, BORN together for that exact same feel and weight for the ultimate signal and communication! Ends are extra heavy for the correct drape!! Reins are available in 1/2" , 3/4" , 5/8" and 1" widths with 8' length. Great for reining, training, Cutting, etc. More Buckaroo Leather Discounted Horse Tack for Christmas! 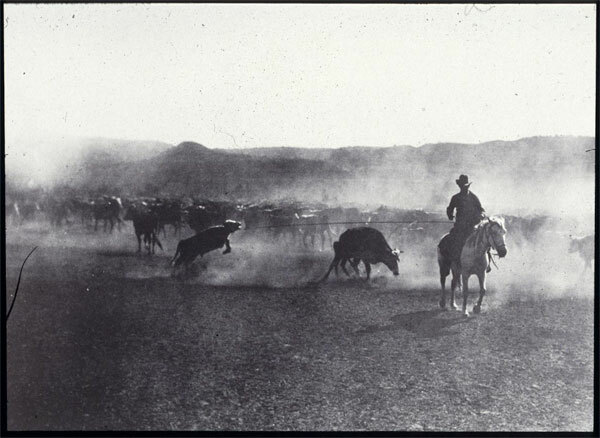 The Lassos were used by Vaquero’s to hunt wild cattle. Until the late 18th century, the Vaquero tied the lariat to the horse’s tail. But the development of heavier, more substantial saddles changed this technique. Vaquero’s began wrapping the end of the rope around the horn of their heavy saddles. This wrapping technique called “Dar la Vuelta” ("take a turn" in Spanish) passed over to the American cowboys, who corrupted the Spanish term into “dally” or “dally welter”. Vaquero’s and the cowboys who copied the practice could slip the rope against the saddle horn and gain leverage against a roped animal. The technique could be hazardous. 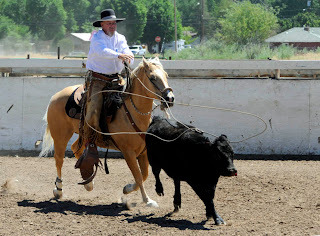 A thumb caught between the Lariat and saddle horn might be amputated by the whizzing rope. The Lariats in California ran from 65 to 110 ft in length and about 5/8 of a inch in diameter. In Texas brush country, Vaqueros used shorter ropes that did not become entangled in the underbrush. In addition to rawhide ropes and horsehair ropes, Vaqueros, used the tough, stringy fiber of the maguey plant to make ropes. Because maguey fiber stiffens in rainy weather, Vaqueros used it only on dry ranges. 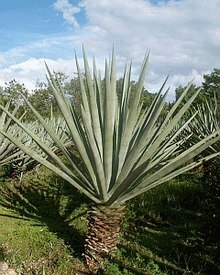 Sisal, (pictured here) from the leaves of the agave plant, ran a distant 3rd to rawhide and maguey as material from ropes. 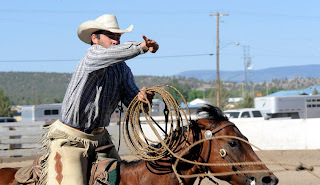 Vaqueros threw a variety of loops, according to the task at hand. A figure 8 would bring down a running animal. The piale, an under hand toss, caught the animals hind legs as it stepped into the noose. The mangana, an overhand throw opened to catch the animals forefeet. 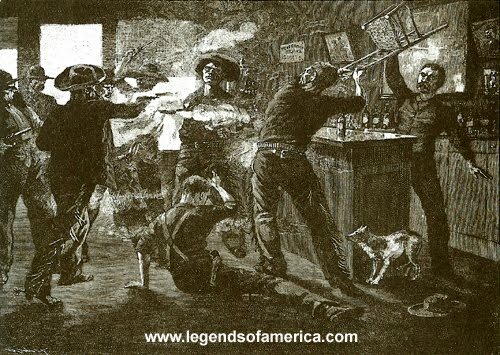 By the late 1860’s cowboys had developed the “hoolihan”. The roper swings the loop only once above his head before letting fly. This fast throw is useful for catching horses by the head in a corral. The backhand forefooting catch is the vaquero mangana. Although ranchers and cowboys were individuals, they nevertheless behaved, or pretended to behave, by an unwritten set of rules that came to be known collectively as the code of the West. The code was a sort of frontier version of the Golden Rule. A cattleman fed a visitor because he might himself be far from home next month. He asked no questions of strangers because in leaner days he might himself have preferred not to have his affairs pried into. He returned stray cattle because his own livestock might wander. The Sunday-school aspect of this unwritten book of laws disappeared entirely when the cattleman felt himself threatened. The code gave him the right to set up vigilance committees whose members acted as sheriffs, prosecutors, judges and executioners, dispensing justice on the spot. If no vigilantes were available for the job, he took matters into his own hands. Since there was little or no law in the Old West, the cowboy made his own rules from the outset. In his unwritten code there were certain principles understood by nearly everyone, and stories of the range are filled with examples of their observance. In Lavaca County, Texas, one February day in 1874, cattleman Willis McCutcheon sized up a spunky young lad named West and decided that despite his youth he'd do to drive the McCutcheon firm's first herd of the year to Ellsworth, Kansas. "You'll get half of whatever these cows bring over the price per head after expenses," McCutcheon promised. The boy said that would do. The drive was halfway to Ellsworth when a five-hour blizzard killed the trail crew's remuda of 78 horses. Having promised to get the cattle through, West traded some cows-and with them part of his profits-for six horses and a mule. A month later he managed to get the cattle to the Kansas market. He sold them off a few at a time during the summer and fall. When West finally returned to Lavaca County in December, McCutcheon's bookkeeper figured the profits, deducting the value of the lost horses (West made no objection). "Are you going to buy a herd of your own, or start a bank?" the bookkeeper joked as he handed over the young man's profit — 75 cents. West smiled and pocketed the coins without a complaint at the outcome of a deal that he had sealed with his word. Two cowpunchers out looking for work rode up to a Texas ranch in time for dinner, expecting the customary offer of a free meal. The boss fed them, but afterward demanded 50 cents in payment. Outraged at this violation of Western hospitality, the men roped a three-year-old steer belonging to their host and used a saddle ring to brand on its flanks the message: "Meals—50 cts." The steer was left to roam the range and proclaim the owner's ignominy. In its simplest form the code was merely a common ethic of fair play, and it worked reasonably well. At the N Bar Ranch in Montana, for example, the foreman fired a hand because he failed to pay a prostitute her promised fee. On the bank of the Colorado River in Texas a young puncher, asked to take the lead in swimming the herd across, said that while he was not a good swimmer and was afraid of the water "I am a hired hand and will not shirk my duty." He made it. Some of the fine points of the code dictated horseman's etiquette. No one borrowed a horse from another man's string without his permission (which was rarely given). One did not whip or kick a borrowed horse. When two mounted cowboys approached each other on the trail both were supposed to keep course and perhaps pass a friendly word; to veer off was to suggest furtiveness —or even danger. But a wave of greeting was considered bad form —it might scare a horse. If one man dismounted, the other did too, so they would meet on equal terms. A man on foot did not grab the bridle of a mounted man's horse, for that could be taken as an intrusion on the rider's control. Other rules of the code governed the practicalities of range land housekeeping. Cowboys were expected to close pasture and corral gates behind them, and to remove their sharp- roweled spurs when they entered another man's house. On roundup a cowboy did not wait for his fellow hands to arrive before beginning his meal; he helped himself and began eating at once so he would be out of the way when other punchers came to dip food from the common pots and pans. In matters of money, most cowboys bound themselves to be trusting and trustworthy. One North Dakota hand gave back part of his wages for digging potholes because he realized later he had dug one of them too shallow. At payoff time on the range bosses might dump sacks of money on the ground and leave them there, unmolested, for days at a time until the boys came by to pick up their wages. On a handshake cattle buyers would take whole herds sight unseen. 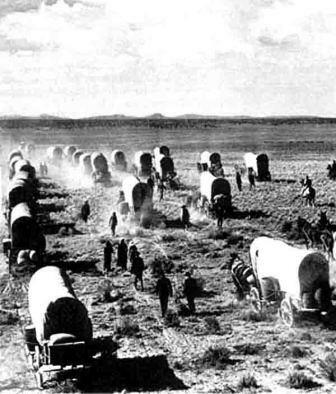 G. W. Rourke, a railroad agent at Dodge City, recalled, "I've seen many a transaction in steers, running as high as 5,000 head and involving more than $100,000, closed and carried out to the letter, with no semblance of a written contract." In the market crash of 1873 Texas cattlemen, stuck with notes totaling $1.5 million to Kansas banks, paid off the debts almost to the penny—at the price of personal ruin for a number of the ranchers.